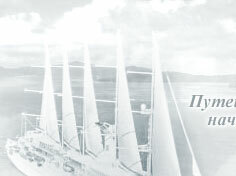 Vympel-tour. Russia, Golden Ring, Suzdal. 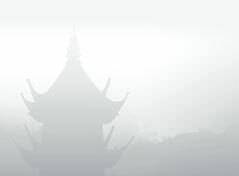 Dates from the end of the XIth century. In the XIIth - XIVth centuries it was one of the most powerful towns of the ancient Russia . There are more then 70 pieces of old Russian archirecture dating from the mid-XIIth to the mid-XVIIIth century on the area of 9 sq km. The Kremlin grounds, the Archibishop's Palace, Spaso-Yevfimievsky Monastery, the Convent of the Intersession, Museum of the Wooden Architecture in the open air. On coming to Suzdal you would hardly figure out that you are in town, for everywhere there are churches, wooden and half-brick private houses with vegetable gardens, and there is almost country-side quietness. But it is therein that the charm of Suzdal lies. 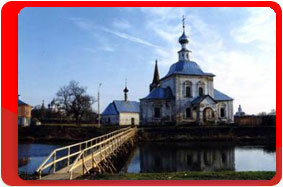 Not only did Suzdal retain the spirit of olden times but it also remained within the XVIII century town boundaries. The Kremlin is located on a winding bank of the Kamenka river in the heart of the old town. 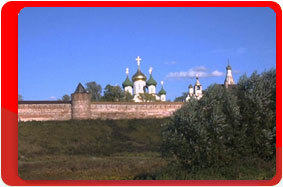 Within the Kremlin are several of the most important monuments of old Suzdal: the Kremlin rampart (XI-XII centuries), the Cathedral of the Nativity (XIII-XVI centuries, its frescoes dating back to the XIII, XV, XVII centuries, and iconostasis to the XVII century), the cathedral bell tower with a tent-shaped roof (1635). The convent was founded in 1364. Its structures date back to the XVI-XVII centuries, and its walls - to the end of the XVII century. The crypt of the Cathedral of the Intercession contains the tombs of royal and high-ranking women banished to the convent. Alexandra - daughter of Ivan III, Solomonia Saburova- wife of Vasily III, Anna Vasilchikova - wife of Ivan IV (the Terrible) were buried here. Evdokia Lopukhina - first wife of Peter the Great spent nineteen years of her life in the convent. Today the town is an outstanding architectural museum, containing more examples of period architecture than any other Russian town, and its original architectural topography was retained. The town population is 12,000. Tourism here is high, not only because of the educational value of the locale, but also because Suzdal has preserved a picturesque timelessness which visitors find interesting as well as relaxing.